Typhoon Mangkhut, the very one that also hit Hong Kong in September, devastated Philippine's largest island, Luzon. 25 Filipinos were killed and over 10,000 families were forced to find temporary shelter. After the storm moved on, lack of sanitation and hygiene resources have the power to continue killing people through diseases like cholera, pneumonia, and diarrhoea. Soap is one of the most important yet underrated tools in the fight against disease and malnutrition. These diseases are the most common killers of under-5 year old children in the developing world. 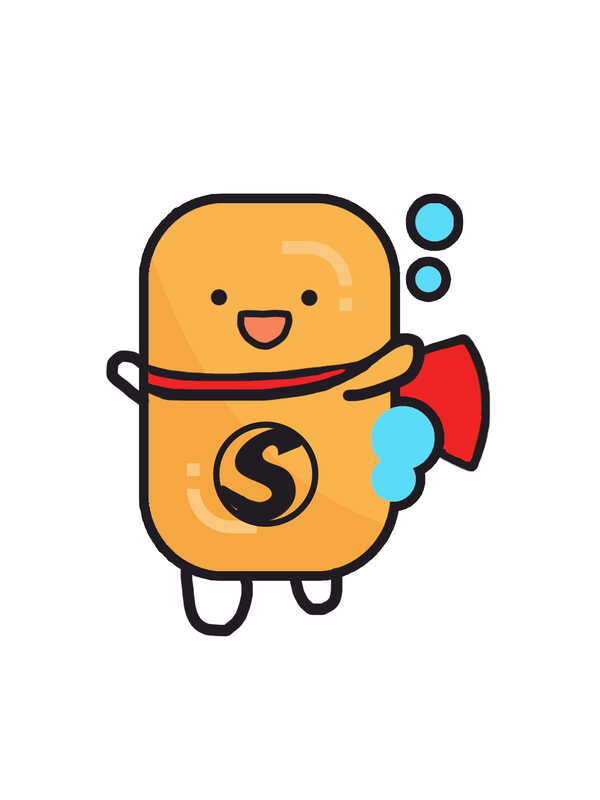 Join Soap Cycling today to become a Soaper Hero and help us ship more reprocessed soap to those in need. 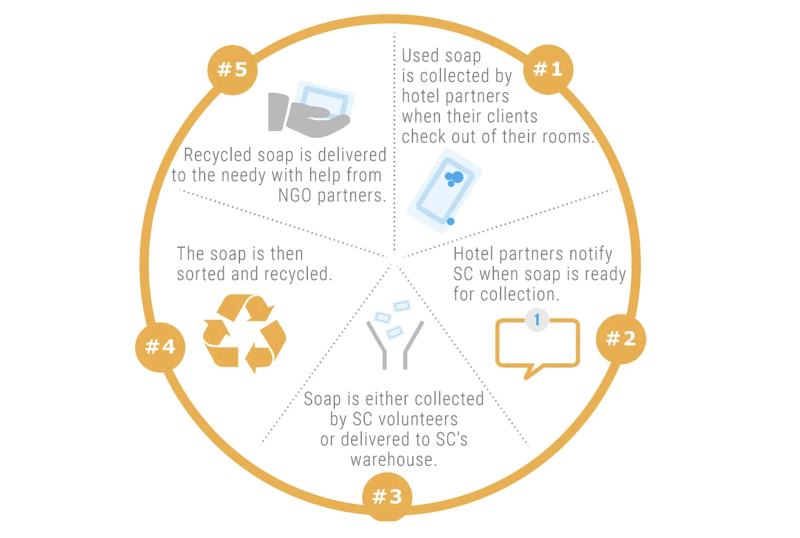 Soap Cycling, Asia's largest soap recycler, has already shipped 16 tons of soap to charities across Asia helping provide WASH (water sanitation hygiene) resources to communities cutoff from the region's rapid development. Founded by students at the University of Hong Kong in 2012, our missions focus on youth empowerment, promoting sustainability, and improving lives through increased access to sanitation and hygiene resources, namely soap. 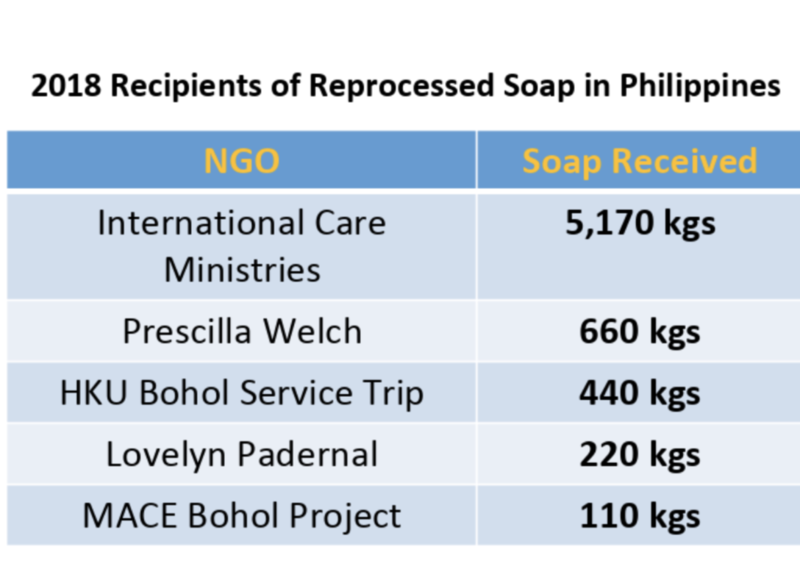 Seeing a need to serve local charities in Manila dealing with the aftermath of Typhoon Mangkhut (and soon to be rocked yet again by Typhoon Yutu), Soap Cycling is calling for support to fund the shipment of an extra 4,000 kgs or 100,000 bars to serve those in need. Help us help those in need trying to rebuild their lives after so much tragedy. Last year, we distributed 11, 660 kg worth of soap, thus, 291,500 bars. 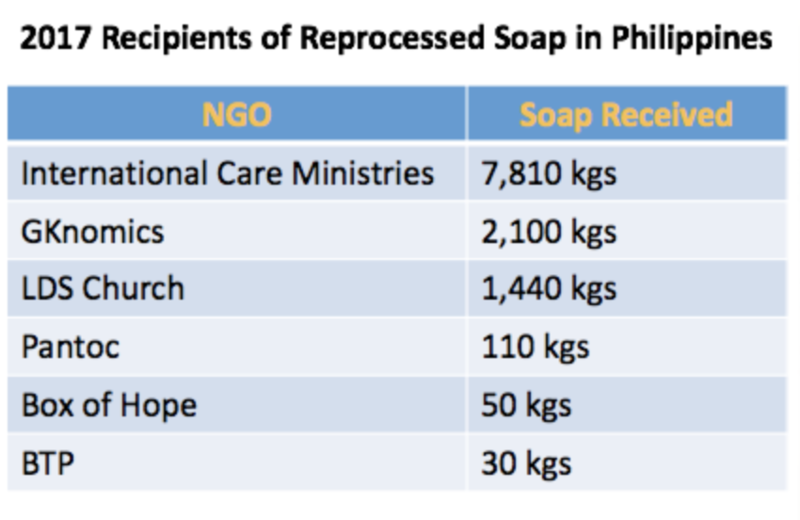 As of the first half of 2018, Soap Cycling has distributed 6,660 kg of soap to the Philippines, translating into 165,000 bars. The specific distribution is presented in the tables below. However, the numbers are rapidly augmenting, for instance, the International Care Ministries has received 9,570 kgs worth of soap till now this year. 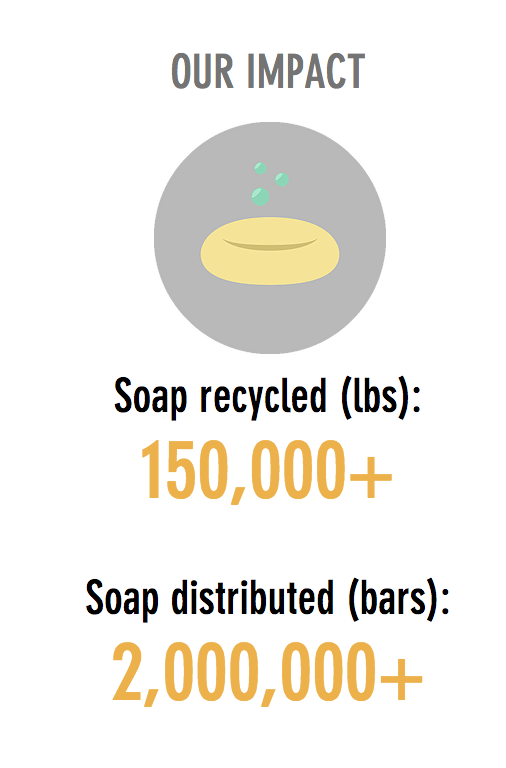 Since 2012, Soap Cycling has shipped almost 3 million bars of reprocessed soap to help keep kids healthy and clean so they can break the endless cycle of poverty. 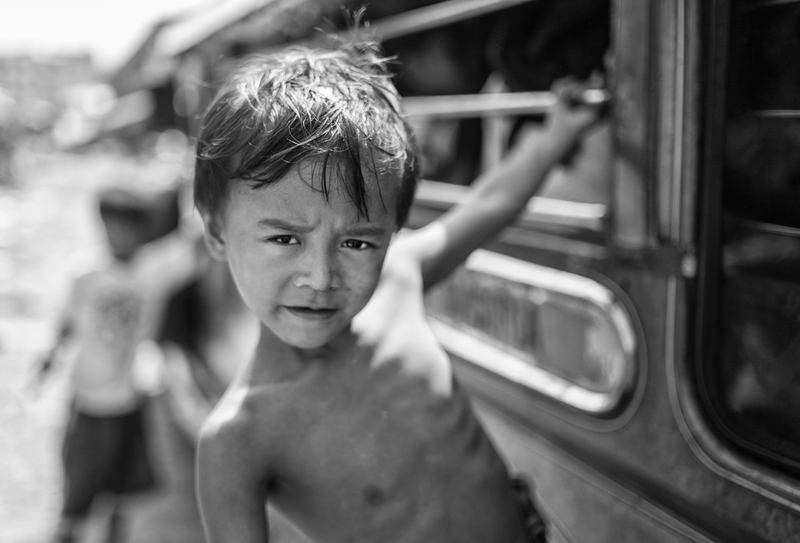 In the Philippines in particular, over 8 million people or 8% of the population live on less than $.50 USD a day, classified as the ultra-poor. Working with charities all over the country, our soap is used to educate families on proper hand washing practices, saving money on medical bills and keeping people healthy and productive for school and work. Every dollar collected from this campaign will sponsor the shipment of soap to charities in Manila and Luzon dealing with the aftermath of two killer typhoons, Mangkhut and Yutu. The more we can raise, the more children that will be able to stay clean and avoid deadly disease. The charities we are working with are mostly small and do not have the funds to help cover the logistics costs: Zone One Tondo, serving slums in northern Manila that are dealing with an influx of displaced people and dangerously crowded living conditions; Kilos Bayanihan, serving homeless street kids by providing free meals and other services not provided by the state; Project Pearls, serving kids who live in massive garbage dumps such as Smokey Mountain in eastern Manila earning money picking rags in incredibly unsanitary conditions that are vulnerable to disease. Even $1 helps with 5 kg of soap and if not money, please help us spread the word with friends and family on Instagram by the #BeASoaperHero and share our Facebook posts. Let's see where we can take this! - You are contributing in shipping about 2,000 kg of soap/ 45,000 bars of soap, which is enough for 4,000 kids a year. - You are contributing in shipping about 1,000 kg of soap/ 22,500 bars of soap, which is enough for 2,000 kids a year. - You are contributing in shipping about 200 kg of soap/ 4,500 bars of soap, which is enough for 400 kids a year. - You are contributing in shipping about 100 kg of soap/ 2,500 bars of soap, which is enough for 200 kids a year.